5 Powerful Natural Remedies for Hair Loss! What are the best natural or home remedies for hair loss and regrowth? My hair's starting to fall out. I don't want to go bald!! The main cause of hair loss (male pattern baldness) is an overproduction of the hormone DHT, which is converted from testosterone. Interestingly, studies have now shown that by naturally blocking the enzyme that produces this conversion (5-alpha reductase), you can slow down and even reverse hair loss. Home Remedy for Hair Loss #1... Saw Palmetto: This is definitely natural remedy number one! The saw palmetto herb contains a powerful plant sterol which has been shown to inhibit the 5-alpha reductase enzyme. In fact, in the July 2010 issue of Advances in Therapy, they featured an article reporting on how low concentrations of saw palmetto (ethanol extract) was just as effective at inhibiting 5-alpha-reductase as the prescription drug, Finasteride, which is commonly used to stop the conversion of DHT. But saw palmetto did it with zero side effects! Saw palmetto can be bought from most health food stores or online. Dosages are in the range of 320 mg's per day and above. Be aware though that it must be a Saw palmetto standardized berry extract supplement or it will not work. Here's the best brand on the market at the moment if you're interested... Doctor's Best Saw Palmetto Extract. Natural Remedy for Hair Loss #2.... Pumpkin Seeds: This is an old folk home remedy for hair loss. According to the “Physicians’ Desk Reference for Herbal Medicines”... the DHT-blocking effects of pumpkin seeds come from the presence of some unusual amino acids including cucurbitin, along with various plant sterols, including powerful delta-7-sterols. You can't overdose on pumpkin seeds so buy a bag full and chew on a handful every day to reduce and reverse your hair loss. plant sterols in saw palmetto do. Researchers from Harvard Medical School reported in the February 2003 issue of The Journal of Nutrition that green tea markedly reduced DHT and testosterone concentration in the blood. In another study, British scientists discovered that catachins shrunk prostate cancer cells by inhibiting DHT and promoting apoptosis (cell death). The caffeine contained in green tea has also been found to help inhibit the manufacture of DHT so make sure you drink plenty of green tea, particularly the most powerful of them all, Matcha green tea, every day! Natural Cure for Hair Loss #4... Soy: Soy contains a molecule that also helps stop the production of DHT. An investigation into 14 studies published in the "American Journal of Clinical Nutrition" revealed that soy actually reduced prostate cancer by as much as 26 percent. The main reason was found to be its ability to inhibit the production of DHT. So, make sure you include plenty of soy in your diet. 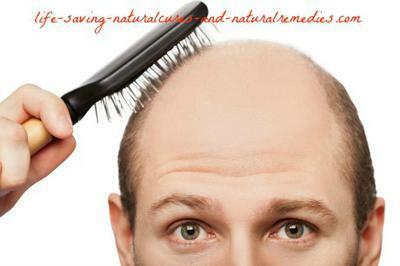 Not just to prevent and reverse hair loss, but to also prevent and reverse prostate cancer! Home Remedy for Hair Loss #5... Fenugreek and Onion Juice Topical Remedy: The fenugreek herb contains hormone antecedents that stimulate hair growth. Onion juice helps to treat hair loss because of its high sulphur content. Sulphur improves blood circulation to the hair follicles, along with regenerating the hair follicles and reducing inflammation. In fact, a 2002 study published in the Journal of Dermatology, showed that almost 74 percent of study participants who applied onion juice on their scalp every day experienced outstanding hair regrowth! So for this remedy all you do is mix together 3 tablespoons of onion juice and 1 tablespoon of fenugreek powder. You can also add one tablespoon of olive oil for extra benefit (olive oil is great for the hair and scalp as well). Apply this mixture onto your scalp and leave on for 30-40 minutes before rinsing off and shampooing your hair. Do this 3 times a week for best results. So there you have it. These tips and remedies will definitely help to regrow your hair. Just make sure you're 100% diligent in your efforts though or they wont give you the desired results. Comments for 5 Powerful Natural Remedies for Hair Loss! Hi Troy. Love your page. I use it as a health guide. How have you not added castor oil?? It's one of the best! Also, whats your opinion on using egg yolks? Yes, very true. Castor oil is great for stopping hair fall, particularly in women. Castor oil is actually one of our favorite "cure all" remedies so it's definitely worth using, especially if you have dry hair & dandruff accompanying your hair loss. Egg yolks are also another good option for hair loss because of the nutrients they contain. Crack an egg into a bowel and mix in a teaspoon of olive oil. Leave this mixture on for approximately 20 minutes then rinse with water and a natural shampoo. Some articles recommend that you only use the egg white or just the yolk, but by doing either of these you miss out on the whole gammut of nutrients that are contained in eggs. So we recommend you use the whole egg!